Yamaha ISX-80 review | What Hi-Fi? There’s something awfully 1984 about having a wireless speaker disguised as a picture frame. But this is the Yamaha ISX-80. 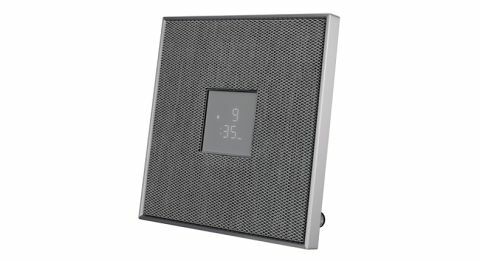 Part of the company’s Restio range and a member of their vast and growing MusicCast multi-room family, it is a two-way stereo wireless speaker – two 30mm soft dome tweeters and a pair of 8cm woofers – combined with FM radio and alarm clock you can stand on your desktop or pop up on the wall. In terms of compatibility, it has much of what you’d ask of a modern wireless speaker: Bluetooth, AirPlay, DLNA, wi-fi, Spotify Connect and a 3.5mm jack, as well as direct access to internet radio. We have few complaints about build quality either; it doesn’t feel like a cheap piece of kit and the remote control, though not the most high-end we’ve come across, is a welcome addition for when you aren’t using your phone. We connect using the MusicCast app and begin playing Animal Collective’s Sung Tongs. The balance is fairly good – the ISX-80 is comfortable letting the midrange through to carry the melody without sounding out of place – and there is a decent enough level of detail. The layered, stereo backing vocals of opening track Leaf House are allowed to come through, there’s some body to the acoustic guitars and you get a feel for the room in which the drum kit, in particular, was recorded. Timing is reasonable as well, although a greater soundstage would certainly help it in terms of organisation. The ISX-80 keeps up with the choppy rhythms of Who Could Win A Rabbit? without it becoming confusing – this more upbeat track also highlights a lot of what’s missing though. What should be childishly excitable feels largely uninterested. There is little in terms of expression and dynamic subtlety and it feels more like a background listen than the delivery of the level of insight you’d expect from a highish-end wireless speaker. We switch quickly to Rage Against The Machine’s The Battle Of Los Angeles in an attempt to tease some fighting spirit out of the ISX-80, but it’s to no avail. Without its antagonistic spit, the impetus is gone and Zach de la Rocha’s vocal sounds limp. Moreover, while still well balanced, you begin to miss what’s lacking in the low end. The lack of drive would surely be overcome with a little extra low-end muscle to get behind kick drums and overdriven bass guitars. Crashing cymbals combined with Tom Morello’s guitar work expose some hardness in the treble, which could also benefit from a little more anchor in the bass. Switching to radio, the ISX-80 feels more at home. Our issues with the sound remain – more expression, a wider spread of sound and some depth in the bass would benefit radio as much as our own selection of tracks – but this is a different kind of listening. Now we can see ourselves with the ISX-80 hanging on the kitchen wall, part of our multi-room family, as we do the washing up. However, we don’t believe background music should cost anywhere near this much. That’s why, despite our appreciation of Yamaha’s MusicCast concept, we can’t recommend this particular extension of it.